How many gadgets do you need for beautiful makeup and right skincare? Not many. Brushes, sponges, body gloves and something for keeping them clean – that’s it. Maybe, not quite 🙂 A cleansing and exfoliating face brush also comes in useful. These are my makeup & skincare essentials. If you want to get to know them better, why don’t you read the post? I have quite a collection! Zoeva, Hakuro, Rainbow… Natural bristle brushes – recommended for sensitive skin – are my favorites. Soft bristles are easy to clean. They evenly spread products and don’t attract dirt or dust. My collection consists of two brushes for foundation, two for powder and a puff. Just in case, I also bought a few lipstick and eyeshadow applicators. I keep the tools in a bag with pockets. The ones I use every day are in a jar on the dressing table, covered with a glass shade. I sometimes use them for applying foundation or face contouring. They are amazing in both cases. My sponges have different colors and shapes; I also have a silicone applicator – SiliSponge. The sponges are great for spreading beauty products. It’s easy to keep them clean and they dry quickly. They easily get to all hard-to-reach skin parts. Using body scrubs has been bothering me for some time. I had an impression my hands got stiff whereas the skin wasn’t well conditioned. That’s why I bought a body glove. It is stunning, soft and effectively exfoliates the skin. If you want the same gadget, you will find it at every drugstore. Recommend it! How to Clean All the Gadgets? You probably wonder how I clean my brushes, sponges and the glove. Let’s begin with the last one. I wash the glove with clothes in the washing machine. I use makeup removers, disinfecting sprays or water + soap to clean brushes and sponges. They soak in the water for a few hours and dry off on the heater. I use it for cleaning and exfoliating face skin once a week. It is a stunner! 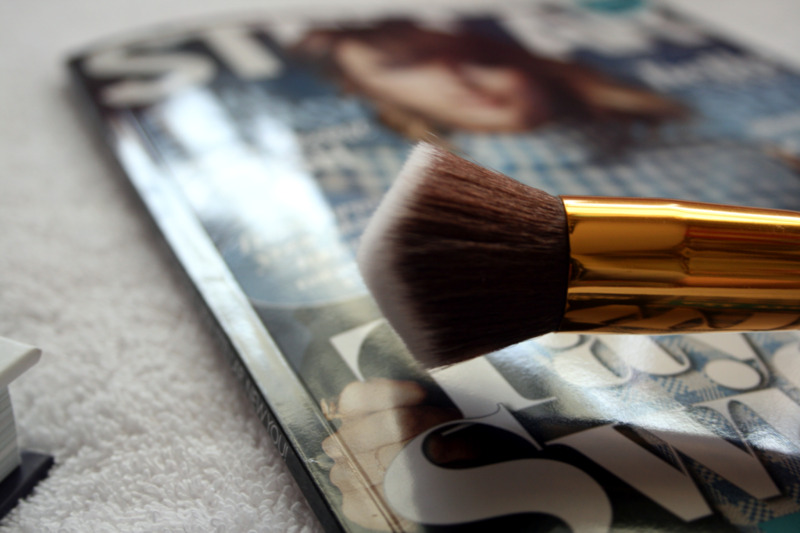 The brush removes makeup leftovers, dirt in skin pores and dry skin patches. I also use it for the neck and chest. Effect? Smooth, clean and firm skin. When you have such a face, makeup and skincare equal sheer pleasure.